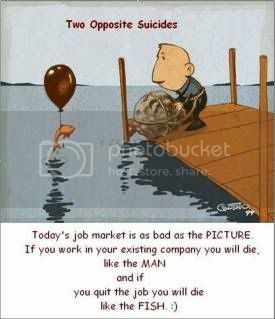 I am about to join corporate next week, and here I come across this picture which aptly defines the current job scenario. The placement scene seen across campuses back then in march said it all. Just about a year back, these very companies were thronging the campus for a slot, and this time over even after a lot of cajoling and sweet talk they relented – Hiring on freeze. Forget hiring, many of the companies are actually firing away their employees, and some 'virtualizing' them ala Mahindra Satyam. This picture, got on a mail forward, very aptly describes the current market scenario. One can't be like the man jumping off, due to the huge liabilities attached and a very remote chance of a job. Also, it is getting tougher with every passing day to continue in the same job with cost cuts, salary cuts, virtualized and all. It is like being in the position of the fish. Why am I ranting on the negatives of the job market just before joining a job? Nah! I am all charged and decked up for the new role. This holiday has really been long, and now I want to work.!! Hi, ur blog is really nice & wonderful, while reading it I truly like it. ‘Online’ CAT, and nothing else! !